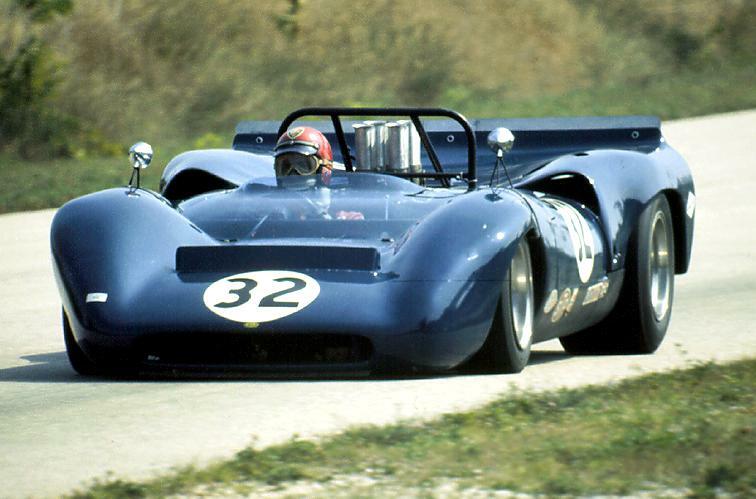 Noted Ford GT and Formula 1 car designer Eric Broadley was instrumental in the Lola T-70 sports car design. This was a semi-monocoque racer made of light steel and alloys with a Fiberglas and reinforced plaster body featuring the soft sweeping curves that made racers of that era so visually exciting. More importantly, it was fast and could accommodate either a Ford or Chevy engine, so was popular for several years in the U.S. Road Racing Championship and famous Can-Am series that featured racing legends such as Dan Gurney, Bruce McLaren, Denny Hulme, John Surtees and George Follmer. Surtees won the 1966 Can-Am title in a T-70 and Follmer raced competitively in a T-70 during the 1966 and ’67 seasons, his best a third at Laguna Seca in California in 1967. Here Revell Monogram reproduces that silvery-blue #16 that Follmer drove. It also has released a red model of Surtees racer (stock no. 85-4885) and now several others. Follmer may not be as widely known as the other greats of that era, but he was a notable road racer, winning the 1972 and ’76 Trans-Am titles, along with the 1972 Can-Am championship, while substituting for an injured Mark Donahue. Follmer also raced in three Indianapolis 500s, a season in Formula 1 and numerous NASCAR races. This smooth sports car is another fine effort from Revell Monogram, using its vast stock of molds from past model kits. Many of us 45+ year-olds remember building models of these racers as kids or teens, and that’s part of the draw here. These Lolas, like past Chaparrals and Corvettes, look great and show the detailing of those original models, and then some. Here there’s the gorgeous paint job and white and red-trimmed numbers on hood, deck and sides. Plus there are original looking tampo logos of the era, like Union 76 and Champion, and Follmer’s name on the car’s side. The driver is well detailed as is the engine’s top that protrudes through the rear cover. There’s a roll bar, chrome gas caps and twin tailpipes out back. 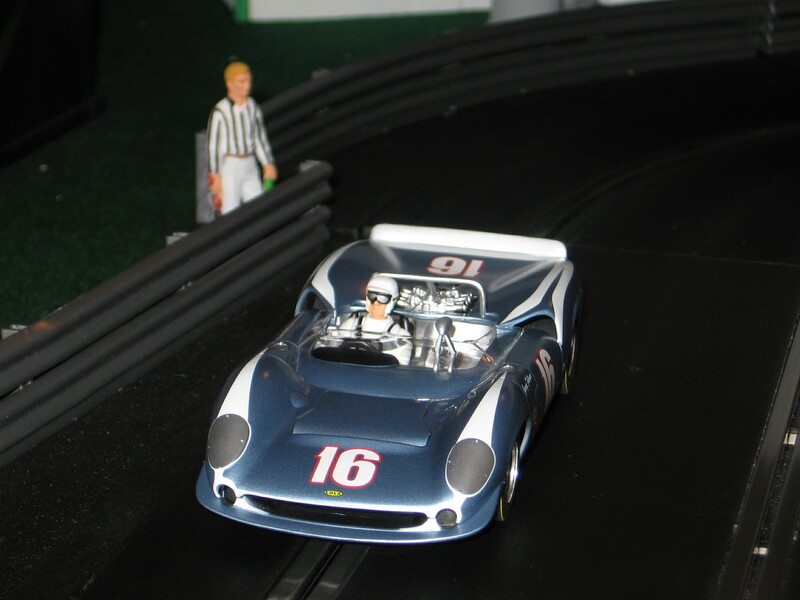 Yet if it didn’t run like a bandit, this Lola would just be another pretty face to decorate a person’s slot car track. But it’s more than that, like most recent Revell Monogram cars. The sidewinder motor, rated at 19,000 rpm, gives it excellent acceleration and the car’s wide stance makes it stick well to the track. The heavy-duty magnet helps too and it can be adjusted, but you need to unscrew its caddy to move it around. As a test on my track, I ran it against my best Scalextric, SCX and Ninco cars, plus a couple other Revells. Only one Revell racer was quicker and two Scalextric Vettes. This turned laps in the 5.89-5.92 second range on both inside and outside lanes and exhibited only moderate tail wag. Times below 6 seconds are good for my track. However, the Lola did tend to roll onto its top once it came loose. I highly recommend silicone tires for added grip, although the stock tires here are quite good.